Research Practitioner, Rebekah Brown from Saint Mary’s Hospital, has experienced first-hand the value of research as her family participated in a recently published breast and ovarian cancer study. The work was co-led by her hospital colleagues, Professors Gareth Evans and Bill Newman and Dr Miriam Smith, who supervised the work of a PhD student, Elke van Veen. It identified a novel type of genetic change, and its cause, which switches off a gene in families affected by early-onset breast and ovarian cancer. The research featured in the American Journal of Human Genetics. 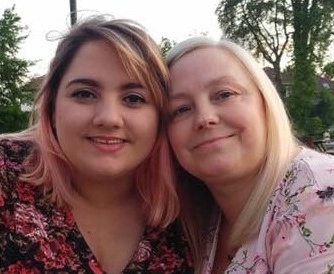 Three generations of 26 year old Rebekah’s Stockport based family benefited from the study: her grandmother and aunty, Pamela and Andrea Todd, who both previously had early on-set breast cancer diagnosed in their thirties, together with unaffected family member, Rebekah’s mother, Paula Brown. The family became known to researchers initially through Pamela’s participation in a breast cancer study over 20 years ago. Currently, cancer causing variations in the BRCA1 or BRCA2 genes are identified in around 20% of families with multiple women with early-onset breast and ovarian cancer. Previously breast cancer associated variants have been described inside the BRCA1 gene. This is the first research to identify that variants outside this gene can result in breast cancer together with the cause, the ‘epigenetic silencing’ mechanism. Research results showed that Pamela, now in her late 60s, Andrea, aged 44, and 50 year old Paula, who works as a NHS Office Administrator, have the genetic change. As a result, Paula’s daughters, Rebekah and her older sister, Jessica Squires, aged 28, were also tested for the variant. Both had negative results. “My mum was previously told she, and the family, didn’t carry a BRCA1 mutation, but did have this new genetic change. This information means she can make informed decisions about her health and I know that I don’t have a raised risk. I’m not going to be spending my life worrying about getting cancer. This personal experience has reinforced my belief in the value of research and I would strongly encourage people who may be eligible for participation to seriously consider this option.” said Rebekah Brown. The study involved 49 families at very high risk of developing early-onset breast and ovarian cancer, but who had proved negative in the usual BRCA gene testing. Two families from Greater Manchester, including Rebekah’s, were found to have this new type of inherited gene variation. Breast and ovarian cancer are some of the commonest forms of women’s cancers, with over 54,000 and 7,000 people diagnosed with breast and ovarian cancer respectively, in the UK, each year. This research was funded by the charity Prevent Breast Cancer and the National Institute for Health Research (NIHR) Manchester Biomedical Research Centre.